the free run of my mind: it's raining, thankfully not pouring... shhh listen, do you hear any snoring? it's raining, thankfully not pouring... shhh listen, do you hear any snoring? …Except when I have to go out in it, and I have my hair done. …or if I’m wearing open toed shoes and I get my feet wet. …or when it happens that I still have grapes on the vine. Then, well - not so much. Why you ask? Well let’s talk about what happens to grapes when it rains. -- I could go into a diatribe about dry farming here, but really, it’s pretty dry (pun intended) so I’ll skip it before I lose your attention. 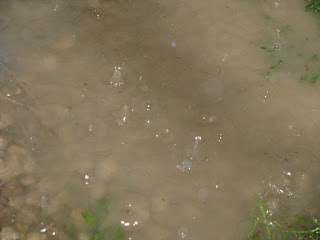 So is it a done deal and are the grapes ill fated if Mother Nature decides to dump a few buckets of water over our head? Not necessarily, but it does bring in several other factors to consider when harvesting and making wine. Now, I haven’t heard of any winemakers trying to summon Zephyrus, but some wind to try to dry things out, usually helps. You see, grape bunches, although not as original as snowflakes, all have different patterns to them. Some are tightly bunched, others are loosely clustered, and depending on variety, clone and sometimes the individual stress of the vine, you are going to see differences in how the clusters are formed, and also changes in berry weight. (No, not all clusters look like the Fruit-of-the -Loom mascot)Some varieties also have thicker or thinner skins (another factor to how susceptible to rot they are) Worst case scenario, you can have a tight cluster of grapes, with thin skins caught out in a shower, with very little warmth, dry air or wind in the days following. When rot occurs, with it, are naturally occurring enzymes, that inhibit the fermentation process, sure you can bump up your SO2 levels to kill the enzymes, but that of course may or may not wreck its own havoc on either your primary or ML fermentation. Rot also brings acetobacter that can bring sky high VA’s if not carefully monitored. But enough technical talk, let's get back to the grape. The skin splitting really lets in the bacteria’s that cause a host of problems for the fermentation. With this swelling, (aside from the splitting problem) the grape suddenly has several other things going on. Inside the grape, the water to juice ratio has now changed, diluting the flavors, and because the grape, now plumper has more internal size, this has also changed the proportions of the natural tannins of the skin and seeds, which is more important in red varieties for color and tannin extraction. And of course the most apparent, the drop in brix (sugar) that has occurred with the additional water weight. Questions upon questions … many the Magic 8 ball, doesn’t have the answer for! Much like the arm chair quarterback, someone will always think it should have been done differently, but in the end, the winemaker can only make the best decision possible with the information available at the time. Do you feel the pressure coming down on the winemaker to make the right call? What about the poor little grape? How do you think that cluster feels? In the words of winesmith Clark Smith, all that the grape ever wanted to do, was become tasty and attract birds, because that’s how they reproduce. Talk about pressure to perform! If you are a gloom and doomer, don’t fret yet. I’m not talking about torrential downpours or anything. Don’t write off the whole harvest because water molecules were spotted in the skies of Sonoma County one day during the 2008 harvest… Up here in the Alexander Valley, its more like the clouds are spitting on us, light and misty but slightly consistent for the last 3 and a half hours, although I have some unconfirmed reports of it being a little heavier down in the Russian River area. I’ve also heard a few rumors of winemakers either ramping up or calling off their picks based on what’s going on outside my window. Tomororw is another day, hopefully we will wake to perhaps wet, but not sour grapes! What a wonderful way to describe the anxiety of the winemaker during crush - and the reason thereof! Thank you. I was trying to show that side to the readers, so they can see, it's not all cut and dry - recipe style if you will.